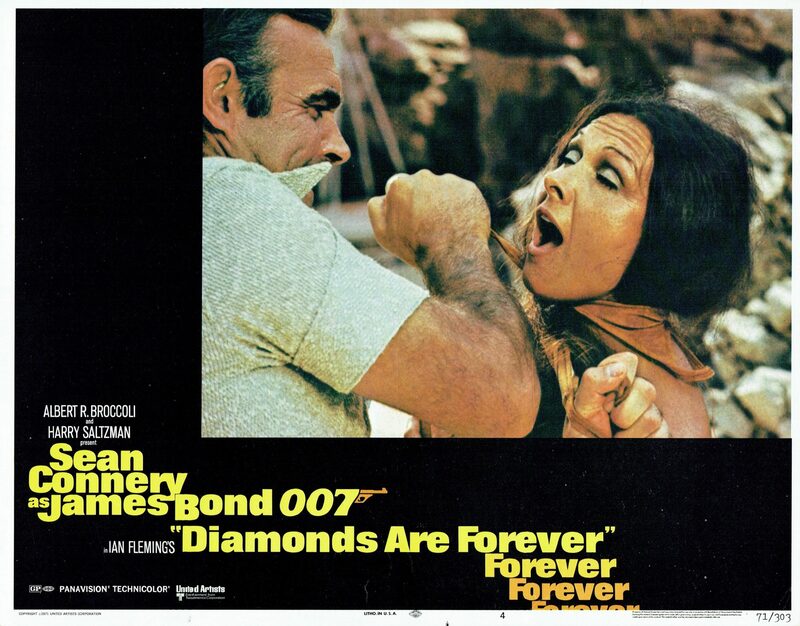 Diamonds Are Forever (1971) is the 7th film in the James Bond series and the sixth and final Eon film to star Sean Connery as the fictional MI6 agent James Bond. 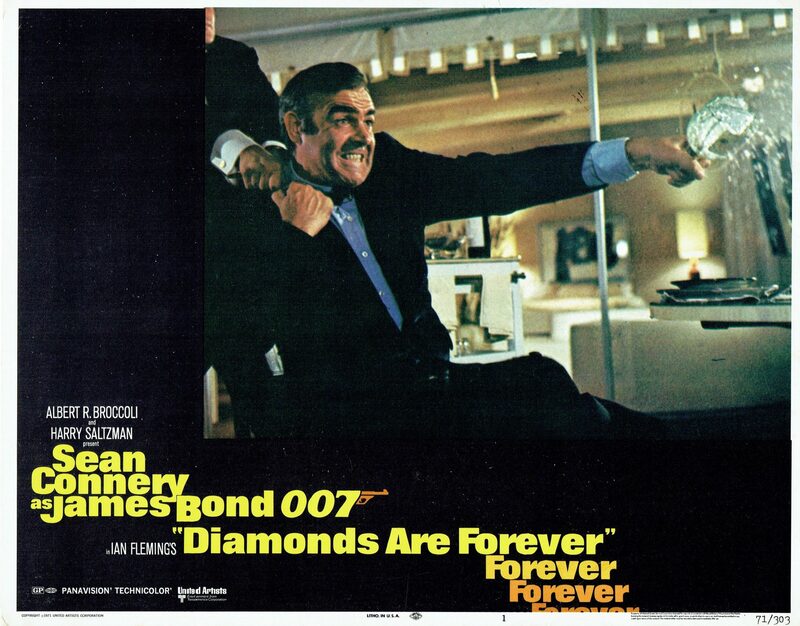 Sean Connery reprised the role of James Bond in 1983 for the Thunderball remake, Never Say Never Again. It was directed Guy Hamilton and co-produced by Harry Saltzman and Albert R. Broccoli. 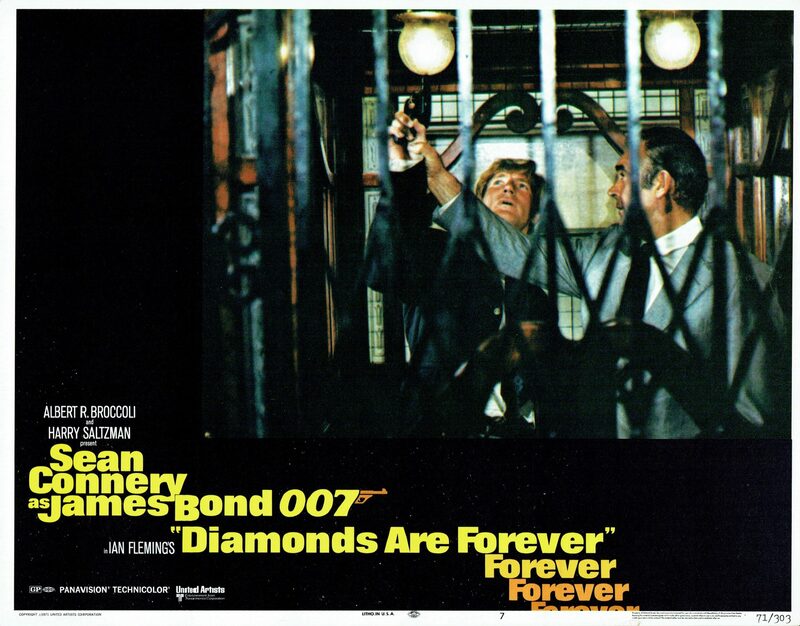 Richard Maibaum and Tom Mankiewicz wrote the screenplay based on Ian Fleming’s 1956 novel, Diamonds Are Forever. The film stars Sean Connery, Jill St. John, Charles Gray, Lana Wood, Jimmy Dean and Bruce Cabot. The storyline follows James Bond as he impersonating a diamond smuggler to infiltrate a smuggling ring. 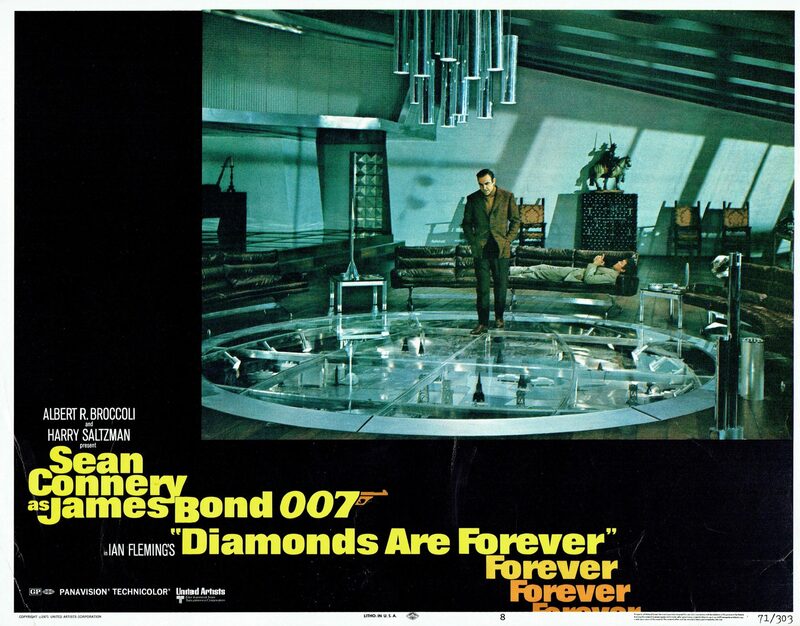 He uncovers a plot by his old nemesis Ernst Stavro Blofeld to use the diamonds to build a space-based laser weapon. James Bond has to battle his nemesis for one last time, to stop the smuggling and stall Blofeld’s plan of destroying Washington, D.C., and extorting the world with nuclear supremacy. 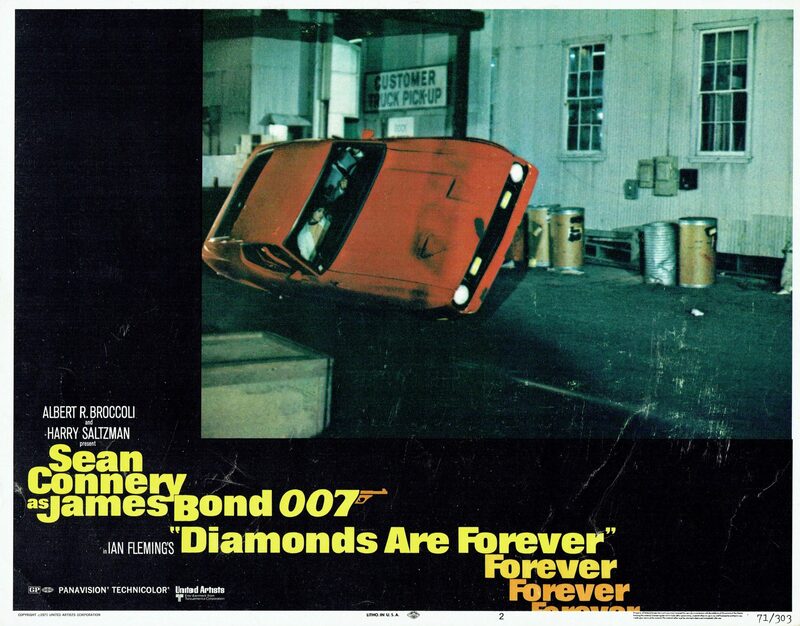 The producers originally intended to have Diamonds Are Forever re-create successful commercial aspects of Goldfinger, which included hiring the same director, Guy Hamilton. Peter R. Hunt, who had directed On Her Majesty’s Secret Service and worked in all previous Bond films as an editor, was invited before Hamilton, but due to involvement with another project could only work on the film if the production date was postponed, which the producers declined to do. George Lazenby was originally offered a contract for seven James Bond films, but declined and left after just one, On Her Majesty’s Secret Service, on the advice of his agent. Charles Gray was cast as villain Ernst Stavro Blofeld, after playing a Bond ally called Dikko Henderson in You Only Live Twice (1967). David Bauer, who plays Morton Slumber, had also previously appeared in that film, uncredited, as an American diplomat. Raquel Welch, Jane Fonda and Faye Dunaway were considered for the role of Tiffany Case. Jill St. John was originally offered the part of Plenty O’Toole, but landed the female lead after Sidney Korshak, who assisted the producers in filming locations, recommended his client St. John, who became the first American Bond girl. 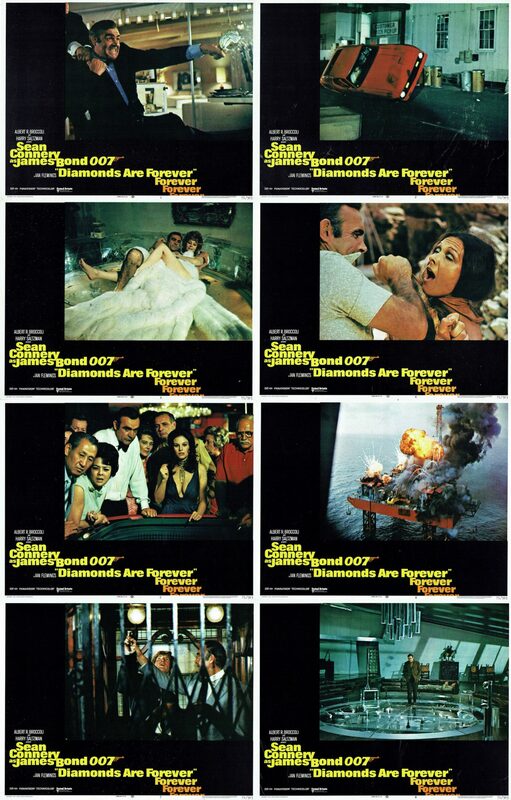 Principle photography for Diamonds are Forever was completed primarily in the US, using locations such as Los Angeles International Airport, Universal City Studios and eight hotels of Las Vegas. The most of the hotels used for filming in Las Vegas were owned by Howard Hughes, a friend of Cubby Broccoli. In the UK, Pinewood Studios in Buckinghamshire was used as well as Dover and Southampton. The climactic oil rig sequence was shot off the shore of Oceanside, California. Other filming locations included Cap D’Antibes in France for the opening scenes, Amsterdam and Lufthansa’s hangar at Frankfurt Airport, Germany. 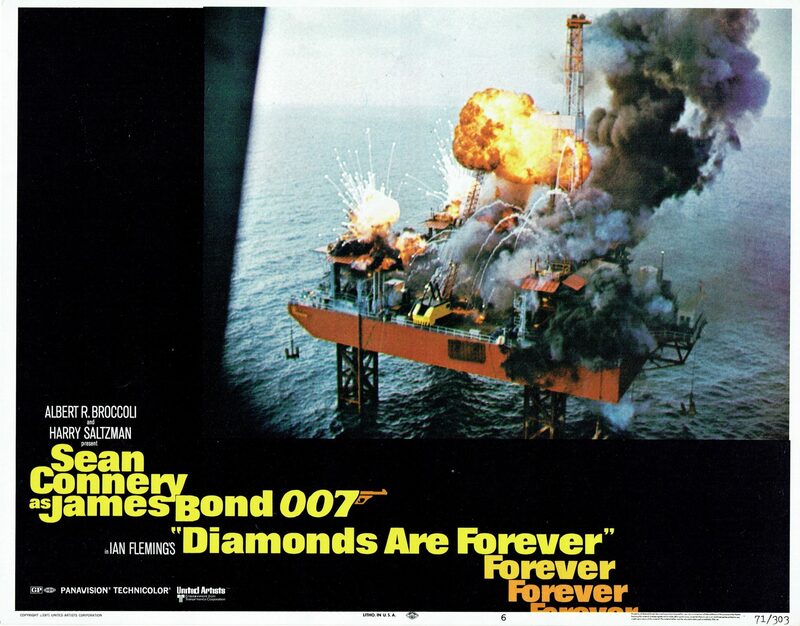 When Diamonds Are Forever was released it received mixed critical reviews. Roger Ebert criticised the complexity of the plot and “moments of silliness”, such as Bond finding himself driving a moon buggy with antennae revolving and robot arms flapping. He praised the Las Vegas car chase scene, particularly the segment when Bond drives the Mustang on two wheels. 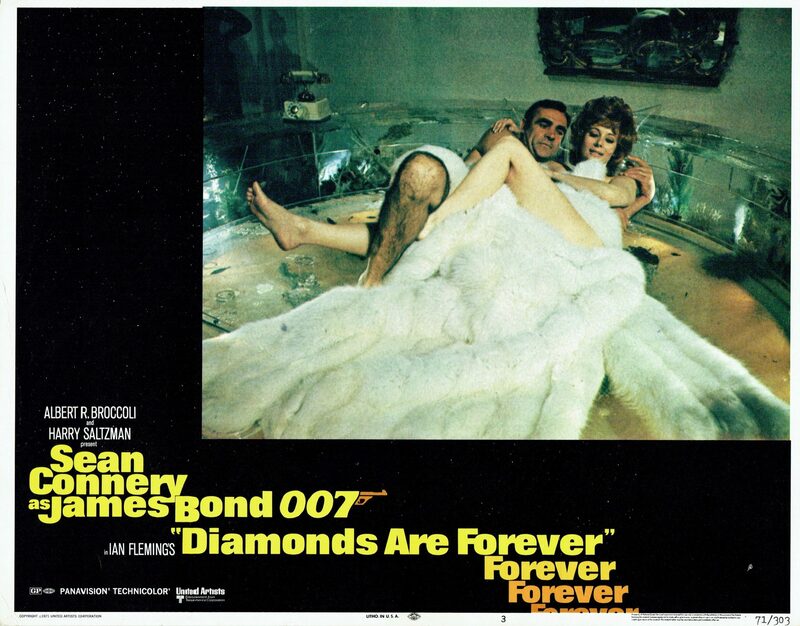 The camp tone had a mostly negative reaction as did the acting of Jill St. John with James Berardinelli saying “one of the least effective Bond girls – beautiful, but shrill and helpless”. 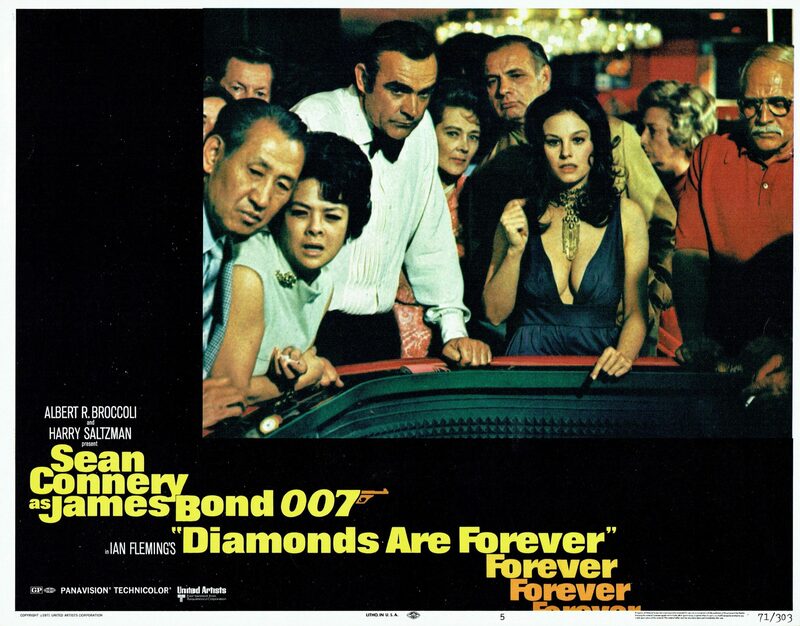 Commercially, Diamonds Are Forever was a financial success. Having been produced on an estimated budget of $7.2m it went on to achieve box office receipts of $43,819,547 in the US and $72,200,000 worldwide giving total gross box office receipts of $116,019,547. The film marked the final appearance of the SPECTRE organisation (though not by name) in James Bond films until the 2015 release of the same name.